Xilisoft Mobile Phone Manager makes your PC a complete mobile office due to its powerful mobile management capacity. Via USB cable or Bluetooth, Xilisoft Mobile Phone Manager can synchronize your phone with PC, backup and restore mobile data, and copy them between mobile and PC. With keyboard and mouse, your contacts, messages, E-mail, notes, favorites, calendar and tasks will always be in sync and you. Key features: 1. Backup important phone content and local data on PC. In case that your mobile is lost or stolen, you can recover all backup data to your new device. 2. Copy your phone contents between PC and phone, or from one phone to another (e.g. from Nokia to Motorola and vice versa). 3. Synchronize contacts, messages, E-mail, calendar, favorites and tasks with PC. Besides, it allows you to exchange data with MS Outlook. 4. Create your own account to prevent your important data from stealing, deleting incautiously, copying or any unauthorized use as your data safeguard. 5. Automatically show your phone info including phone model, image, name, phone capacity, SIM card capacity and Carrier. 6. You can read, modify, write the phonebook, create new contact, and set individual contact picture as much detail as possible. 7. Record your every calendar and task. With the reminder applied, you will never miss any one of appointments, meetings and tasks. 8. Allow you to view and read inbox, outbox, drafts, sent items, received and missed calls, call history, and display basic message info. 9. Provide the ability to manage more than one e-mail account, read and delete E-mails. 10. 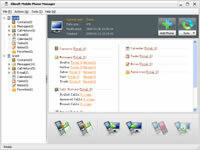 Simultaneously connect one or more phones to Xilisoft Mobile Phone Manager and manage device content effortlessly on your PC. Xilisoft Corporation focuses on the users experience all along, offering the most easy-to-use software and consummate service.